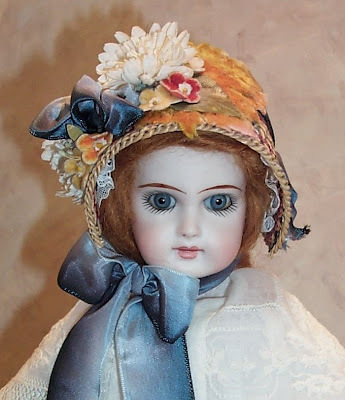 You can create the most beautiful and well fit hat designs for your dolls by simply easing the straw braid in and out as needed for your design. 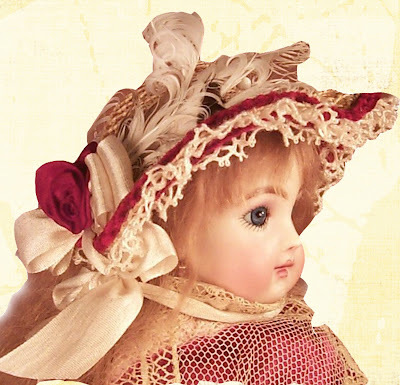 In designing doll hats, especially those of straw braid, I have found a wonderful use for my small treasures of fabrics, trims, laces and findings. Not large enough for most projects but too beautiful to waste I use these to embellish both cloth and straw hats. 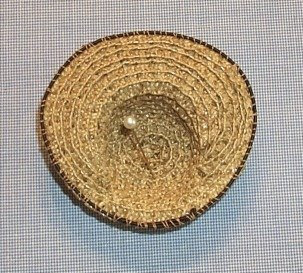 We have unlimited choices for our designs with so many colors and varieties of straw hat braid available to us today. 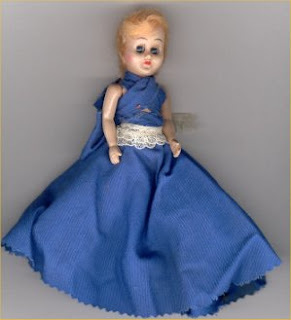 The straw braid is so versatile in designing not only for the antique reproductions but also for our modern dolls as well. And as it takes so little braid to make a small hat, it also takes not as much time as you would think. 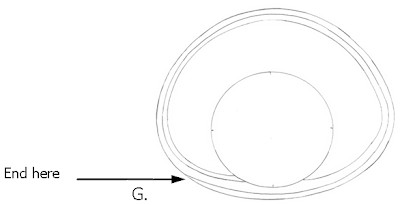 In measuring the doll’s head I use a circle template. 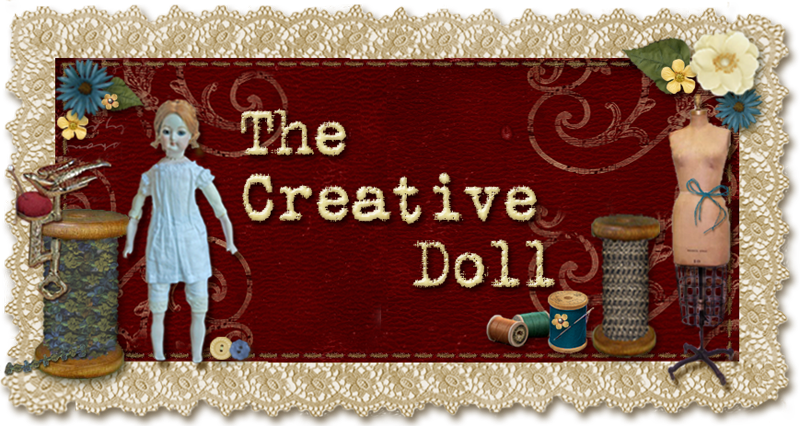 I simply place the template over the doll’s head to the depth my design requires. 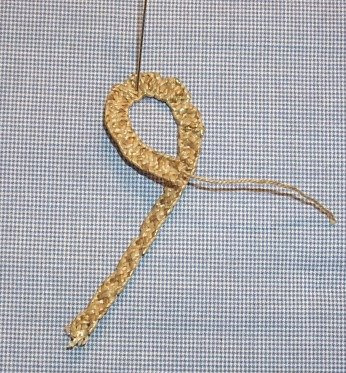 I now use this size from the template to measure my progress as I sew the straw braid. Please remember to take into account the doll’s hairstyle when measuring. 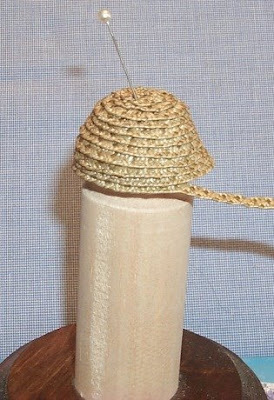 Let us begin with a “Mary Stuart” style straw braid hat for a Petite Milette. First, ready the straw by running firmly through your fingers to release any sizing and to make the straw pliable and easier to work with. 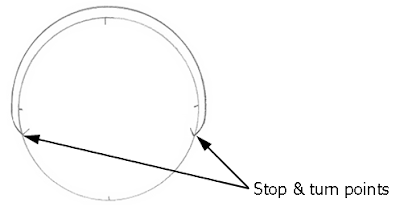 You will need to do this throughout the construction of your hat. Find the pull thread at edge of braid and pull this carefully. 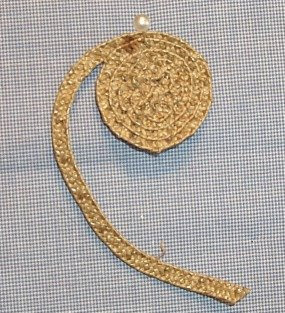 This will cause the braid to curl and make it easier to sew in a circular pattern. Trim end and dot with glue and turn under to secure. Repeat this row until you have 6 rows (3 fold backs on one side and 2 on the other). Each fold back edge will be a bit lower than the preceding one to prevent bulk. You can see in the following photo below. From the crown edge where it meets brim, you will be easing in the braid enough to make the brim flat. 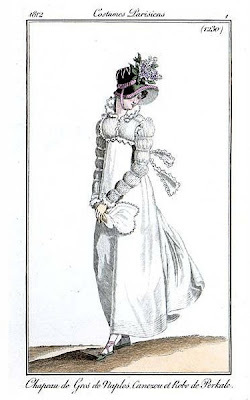 Please Note: If the brim becomes wavy, rather than flat you are easing too much. 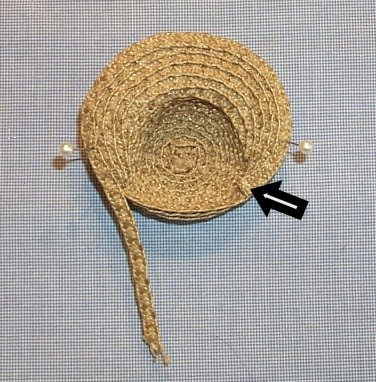 After completing 3 fold backs on one side, rather than folding back when you come to the opposite side again, continue this row down and around back of hat and then again, all around hat, making an additional 2 rows as shown in this photo. End the last row easing the end of straw under the preceding row, keeping a nice continuous curve along edge as in Diagram G. Cut straw braid and dot end with glue to secure it under preceding row. Knot and cut thread. Attach wire to the underside of brim edge with an overcast stitch. Shape wired edge brim to your design shape. Glue or sew lace to underside of brim to cover wire. Decorate to your hearts content! 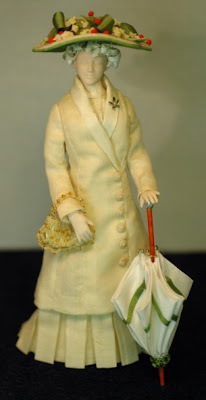 She also has doll millinery patterns for sale on minidolls.com. Thank you for visiting our blog and hopefully you enjoyed the article. Just as a gentle reminder, that tutorial was written to help to stimulate your creativity. This Tutorial, Pictures, & Instructions are copy-righted & are not to be used as a tutorial of your own. This means you may not copy and post this tutorial to your own website, or print it out and sell or distribute it as your own. How do I keep my hand in a practiced at "real" sewing? I get invited to a shower for one of my special friends. I knew my friend Jeanine was having a baby girl. 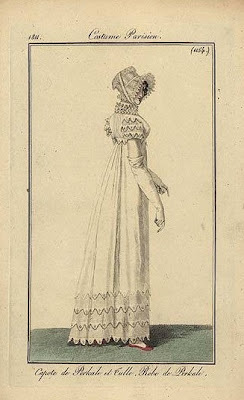 This is from a pattern from a local French Hand Sewing artist. (I mean she is an artist with a needle!) Using her pattern I was able to make Ally's dress. 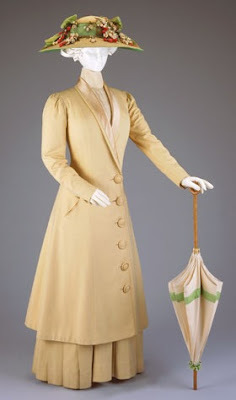 The dress is made with Swiss Batiste and French laces. 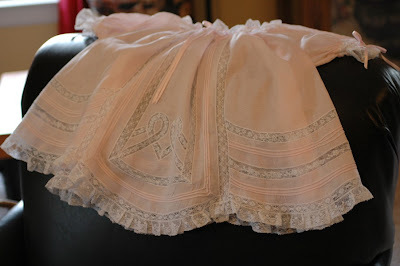 It is French Hand sewn, and using a machine as well. 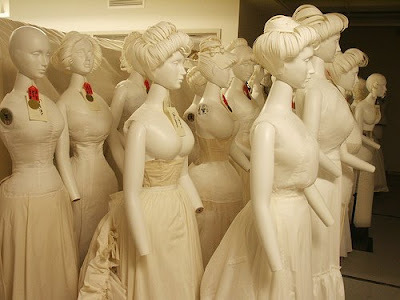 Do I have any of these dresses, well I do have a few and we'll be seeing them in the future. I seem to give most of them away. But they come from my heart and my hands. 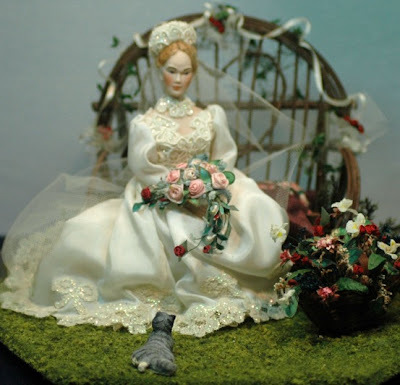 In coming articles I will point out a few I have made especially for dolls or display and have kept. These same techniques can be used on your dolls as Michelle carries the finest Swiss Batiste from Bear Threads called Bearissima. It comes in White, Ivory, Peach, Lt Blue, Mauve, Ivory and Ecru. If you have never worked with fine batiste like this it will be a treat. She also carries a full range of French and English cotton laces. 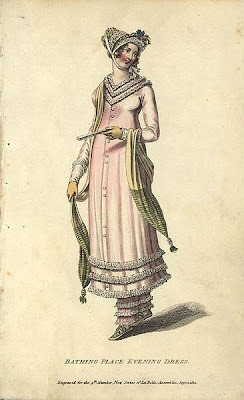 Paris 1812 Day Dress 1812 Seaside Costume London Plates from the University of Washington Libraries, Special Collections Division. Since we have discussed so many tools this week, I thought I would share what I sometimes stuff inside the box. Neatly stuffed in the back behind the plastic boxes is a circle template and a small self healing cutting surface. 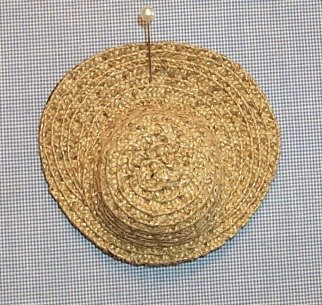 The circle template is a must have for miniature hats. I also have ovals, ellipses and squares. But they are tucked away in a sometimes used folder. (the Expressions cutting mat was a freebie. I LOVE the magazine. So creative.) The mat is about a 5" x 7" mat. Very convenient for traveling. In the picture of the travel bag closed you will see another tool I keep handy. My friend bought me this for my birthday last year and I don't go anywhere without it. Shown open the Omnigrid has an ironing surface and a cutting surface. Fabulous tool! You've got to love quilter's! The work surface is covered with a nonstick ironing pad. Bakers call them silipads. (Silicone coated fabric) That is the brown pad underneath. The class sheet is used in scrap booking, but I use it for pattern drafting, and many other things. It is great as a non stick surface and easily cleaned as well. When I am not working I leave the protective sides on it. The long hot pink plastic basket in the back has cleaner for my glasses, glue sticks, Glove in a Bottle (wonderful for your hands) more glue, glue bottle, water spritzer and Fray Check. You'll see pin cushions and extra lighting. What is not pictured here is my magnifiers. I use the kind that cli p to the front of my glasses. Often these are also found in quilt shops. This concludes the travel bag and organized desk section. I look forward to bringing you another section for Tools that will show you the various jigs I have and use. There are some pretty creative ones , too. If there is anything about the tools you would to know or see demonstrated, let us know! Wire! We are getting to the end of the tool box now. It is obvious that I cannot put too many tools in this box, so choose your very favorites. These are mine. The first set of "pliers" has a flat wide jaw. (3/8") It is of very good quality. With red handles the next set is a fine nosed rosary pliers. (I think these are also called chain nose, but I could be wrong) Wire cutters are next with blue handles and rounding out the pliers are another set of rosary pliers that are larger. Please buy the best quality you can afford. The results are worth it. At the top is a bit of wire just in case, a small Phillips head screwdriver and a small jeweler's flat head screwdriver. Arrange these neatly as the plastic could crack. Write. Well, is there anything to say here? Well, maybe a few notes. Filled it looks like a child's pencil box, but my pens and pencils are a little more special. Well, I am going to tell you that anyway! Here's what you'll find as my favorites, the ever popular ball point pen. The cool thing about the ball point is that if you scrapbook, you can use your own writing, sprinkle your embossing powder on it and heat with the embossing gun. There you have a beautiful embossing in your own hand. Next is a metallic pen. Pictured is gold, but I have silver as well. A mechanical pencil is a must, as well as replacement erasers and leads. I also have, but not pictured here is the click eraser. Love it. The large art eraser and a pencil sharpener for colored pencils, regular pencils and my watercolor pencils. Sharpies, or permanent markers in both sizes. (I also use the fine Sharpie to write my name on all my tools.) finally you will see a Micron pen. I have a set of these in several sizes and colors. Other really important and valuable tools you might consider are water and air erasable fabric markers and quilt marking pencils. I use a white for dark fabrics and black for light fabrics.